This group is named in homage to Claude Garamond and Aldus Manutius. These original serif fonts are exemplified by the work of Claude Garamond in Paris in the early to mid-1500s. Robert Slimbach released a new interpretation of Claude Garamond’s and Robert Granjon’s styles called Adobe Garamond Pro—now ramped up to Premier after redoing the OpenType version. Garamond was the first major type designer. He was not a printer or calligrapher, he was a freelance punchcutter. Along with Robert Granjon, Geofroy Tory, and others, they were responsible for what is currently called the golden age of typography. Some call this the French Aldine because this is a definite progression from those stately reserved fonts. Garamond lowered the x-height, and increased the height of the ascenders up and the height of the descenders down. The result was a classic font design that became the standard in Europe for the next 150 years. Writers wax rhapsodic about the majestic airiness & the like. One of Claude’s major innovations was the conscious decision to design a complementary italic companion font. As font design began, italics were completely separate. The first italic font cut was by Griffo, again commissioned by Aldus Manutius, in 1499. These early italics seem very condensed to us, with elliptical bowls and very calligraphic stroke endings (as opposed to actual serifs). Oddly, many of these fonts have vertical serif capital letters. This was the cursive handwriting of the period. They do not make good companions to modern fonts. They were closer to what we now call script. As you can see, it is quite a stretch to really say these are companion fonts, but this disconnect has become the standard that we assume is correct. The major thing to remember in all of this is that we are dealing with the popular leader and all of its copycat versions. There are hundreds of versions of Garamond. 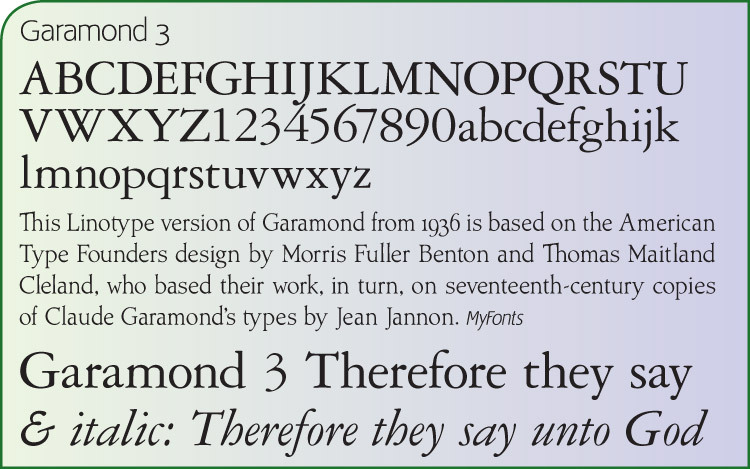 Garamond 3 (which we have chosen to use) is actually built off a type design by Jean Jannon in the seventeenth century. According to Alexander Lawson, his designs (which are directly derivative of Garamond’s) are the principal source of most of what see called Garamond. None of this matters, as Garamond has become the standard by which all other serif font designs are judged, for most people. They all have certain characteristics as we have mentioned. The counters of the a & e are very small: Although, as you can see above, they are not as small as Jenson. It really depends upon the version you end up with. Hoefler calls the overall look soft, though I have no idea what he is referring to specifically. Like all superstars, Garamond’s virtues are vastly overrated. I guess I should just say it. I’ve never really liked Garalde letterforms. Many of the them look distorted to my eye. But I am certainly in the minority.